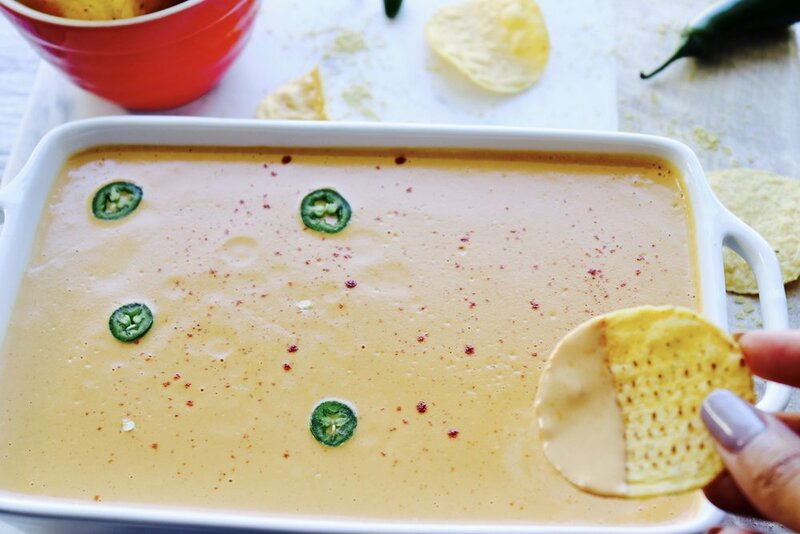 Nacho Cheese is a staple in our household. @blackcalivegan and I seriously make deals to get dibs on the last bit of cheese. “I’ll take out the trash for 3 weeks if you let me have it.” or “Well, I’ll buy the groceries and make a new batch tomorrow if you let me have it.” Yes, that’s just how serious it is. 👊🏾 I often make it for parties and potlucks at work. Most of our friends, family and coworkers do not know it is 100% vegan. The last time I took it to a potluck, one of my coworkers took a look at my cheese and then the thick neon yellow Costco cheese warming in the pot next to it. He leaned over and whispered, "Can I have some of the cheese you brought because this Costco version doesn't look normal. I do not think cheese is supposed to glow." 😂 Moral of the story is, for those of you who want to judge vegan cheese and refer to it as "fake cheese", look at the ingredients listed on the back of the cheese you buy from stores. Then tell me whose cheese is "fake." *Start with 2 cups of water and slowly add more for a thinner consistency.